This past August I had the pleasure of judging a short story competition hosted by Anela Deen. The winning entry was published in her newsletter, but I’m excited to host Aria Maher, the author of that entry, here on my blog. 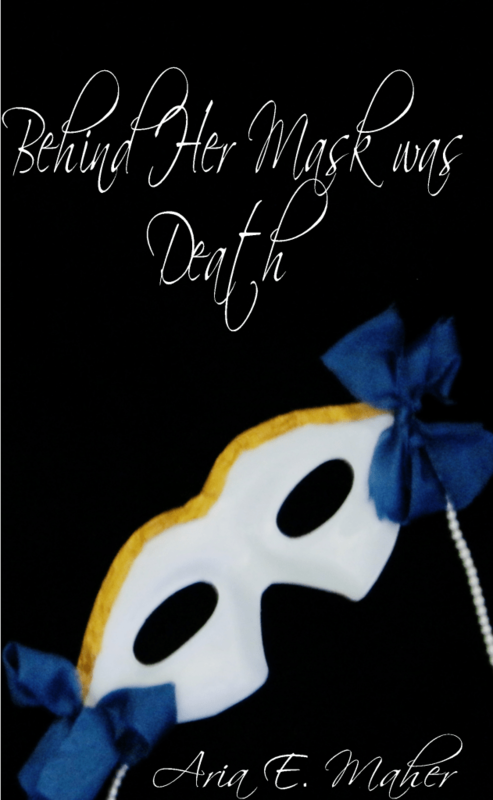 Aria is releasing her debut, Behind Her Mask Was Death, in just a few short days. Without further ado, here we go! Devon Lavender never thought he’d end up in the middle of a murder mystery. But when an unnamed red haired woman dies in his arms on the dance floor in the middle of the Prince’s extravagant costume ball, it would seem obvious to everyone who the killer is. Devon finds himself with one chance, and one chance only, to prove his innocence and discover the real murderer, before it’s too late. Behind Her Mask was Death releases October 1st, so keep an eye out for purchase links coming soon! UPDATE: The paperback is now available on Amazon US! Ah, a nice murder mystery to curl up in bed with… Now, let’s hear a little bit more directly from Aria and Devon! To start us off, can you, Aria, sum up your novel in a tweet? Aria: As far as I can remember, it was last October when we ‘met’. I worked on the book, which is a novella, by the way, for a little less than a year before it was finished, and although other characters have come and gone, or changed substantially, Devon has always been the same. Devon: We met right in the middle of things, really, at the Prince’s costume ball. Um… *laughs* It was… It was a very, er, interesting time. And, well, the next thing I know, I’m head over heels in trouble. Aria: The first thing I noticed about Devon is how very shy he is. He’s very cautious, but sometimes his head just takes over and he’ll do or say something that’s bound to get him in trouble. Aria: *laughs* Esmeralda, definitely. She’s really the heroine of the story, but she’s just so very sarcastic and a bit off beat, I guess. She’s the only daughter of the Grand Marquis, who is the ruler of the kingdom of Plutch, where the story takes place, and even though she’s supposed to be the genteel, proper lady of the kingdom, she’s more interested in dead bodies than tiaras. But she’s taken a liking to Devon, and maybe a bit more than just a friendly one, if you know what I mean, and that’s just embarrassment waiting to happen. Aria, what do you feel the worst about doing to Devon? Oh, everything. I just feel really bad for him, because the entire plot hinges on the fact that if he doesn’t figure out who the real murderer is, the Grand Marquis is going to have him executed. The book is mostly me just doing bad things to him. He’s fallen like ten feet down a dumbwaiter shaft and been chased through the palace by angry guards. But I probably feel worst about inflicting Esmeralda upon him. Devon, if you could say just one thing to Aria, what would it be? Devon: Um, most likely I’d end up visiting my cousins or my friend Daniel Marks. I would probably go to the theater, as well, er, if there was play I wanted to see. And then I would read for a while in my room, or in the garden, and perhaps take a walk. Those sound like some great days right there. Ice cream, books, going for a wander… I can’t wait till my kids are old enough to want the same things. We are going to live the high life, folks. Aria: I’d say yes, but I really don’t know when. I’m thinking of writing a prequel, but that’s a maybe! I am working on some ideas, but don’t expect anything super soon. I’m very bad at making deadlines and sticking to them. Devon: I would think so, as well. Um, I think there are many more things I have yet to do in this world. Aria, what does Devon do that annoys you the most? It’s only really come up when I’m working on ideas for other books, but Devon will not always tell people what he actually wants. He always seems so afraid to upset people, and he’s so cautious, but sometimes I just want to yell at him, like, “Devon, if you would just say this one thing to this person, you might actually be able to get what you want or clear up this issue. Seriously!” It’s something I struggle with too. If someone asks me what I want, sometimes I won’t tell them if I think that they won’t like it, or if it seems like too much trouble. Oh yes, I know this feeling well. It’s funny how characters never really listen to their authors, isn’t it? Aria, what have you read in the last few months that you really enjoyed? For father’s day, my dad got a series of fantasy books called The Evenmere Chronicles. Of course, I begged to be allowed to read them, but he said I had to wait until he finished all the books. Fortunately, I didn’t have to wait that long, and I’m really glad he finally did let me read them! The Evenmere Chronicles is definitely my favorite fantasy series. Of course, now that dad has started reading the books, I’ll have to wait until he’s done before I can read them again… Also, I recently read A Series of Unfortunate Events, which I’ve been meaning to do for a really long time. I didn’t really like the ending, but I did enjoy the intrigue and mystery of the series, even if not all of it was explained. Aria E. Maher has been a writer for the better part of her life. When she was eight years old, she wrote and illustrated an entire series of homemade books chronicling the adventures of Super Mario, Gandalf and various other video game and book characters. 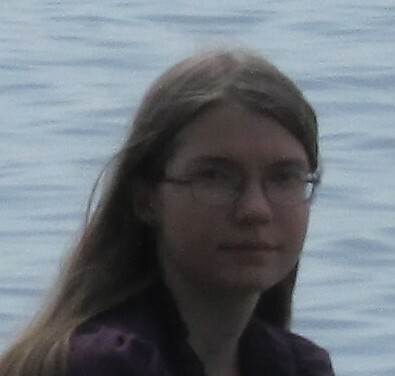 At ten, she filled countless notebooks with diagrams of robots and circuitry, before she decided that the life of a robotics engineer was not for her and resigned her ruler and pencil in favor of penning fantastical tales on her faithful laptop computer. Aria’s favorite inspirations are Steampunk costumes and illustrations, Allan Bradley’s Flavia de Luce novels, anything by Terry Pratchett that she can get her hands on, N. D. Wilson’s delightfully creepy fantasy books, and the slightly enchanted woodlands not too far from her house, where she and her family take long walks on Sunday afternoons. Previous Post: « Library Love Giveaway!